This definitely seems worthy of a mention. VR-Zone says they have a source telling them Sandy Bridge-E chips will ship without coolers. 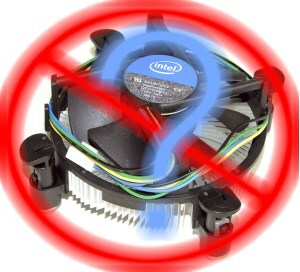 How many of you rely on aftermarket coolers for your CPU? We don’t know anyone that thinks Intel’s stock coolers are great and when details reached us of Intel not shipping coolers with its upcoming Sandy Bridge-E processors we were at first surprised, but considering the target market it makes a lot of sense. Continue reading the full article at VR-Zone. To many an overclocker, this is certainly a logical step. Hopefully it will result in ever so slightly reduced prices, but for now consider me skeptical on that point. If nothing else, it will reduce a tad bit of e-waste from the enthusiast’s junk pile. Yea, probably a cost thing that made them decide to do that. Seeing as the standard cooler they have been supplying will certainly not keep those cool at even stock speeds. Also those really nice heat-pipe style coolers are probably expensive. ... Return to article to continue reading. For a completely stock system, why waste the money on an aftermarket cooler other than to make it quieter? I don't have a single system that is using the stock heatsink (sans servers, of course), so I'm not affected by this change. Although I'm sure we won't see any form of a discount in return for it. Doesn't affect me in the slightest though. @180watt TDP.... kinda not surprised. Best solution IMO would to ask major retailers such as Newegg/Microcenter/Fry's to offer the CPU and Intel cooler as a combo package for the same price as the CPU. Buy it if you want it, leave it if you don't. I guess this means that OEMs will have to outsource to another manufacturer for CPU coolers?